12 students from Baraga were on the Michigan Tech campus this week participating in a KBOCC (Keweenaw Bay Ojibwa Community College) STEM outreach-funded Great Lakes Science & Engineering Camp at the Great Lakes Research Center. The event was coordinated by Joan Chadde at the Center for Science & Environmental Outreach. The KBOCC program provides free science and math enrichment opportunities to middle and high school students in Baraga County. During the school year the KBOCC department provides after-school and Saturday workshops in music, science, math and engineering. On campus this week the students participated in a variety of programs with Tech faculty and GLRC personnel. From Tech Today, by Joan Chadde. 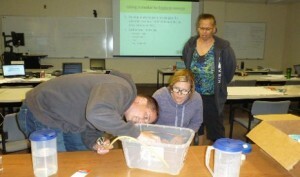 Middle-school science teachers from across Michigan are back in school themselves this week at Saginaw Valley State University (SVSU), Grand Valley State University (GVSU) and Michigan Technological University, working on a new and better way to teach middle-school science. They are participating in the Michigan Science Teaching and Assessment Reform (Mi-STAR) program. Learning ways to connect the sciences to each other and to real-world problems, biology, chemistry, physics and earth sciences teachers are working together to create a new kind of science curriculum, one that crosses the traditional boundaries between science subjects and engineering and focuses on solving real-world science problems such as ensuring access to clean water and sustainable sources of energy. Learn more about teacher professional development at Michigan Tech. “We feel that it’s important for our students to be able to understand that not only science is important in the classroom, but it’s also important in your everyday life,” said Yonee Bryant-Kuiphoff, Kalamazoo science teacher. Read more at Upper Michigan’s Source, by Aleah Hordges. This five-day Institute will prepare you to engage your middle and high school students in a real-world study of the effects of global change on ecosystems, including the impacts of climate change, elevated carbon dioxide and ozone levels, nitrogen saturation, acid rain, and invasive species. Learn more about the Global Change Summer Institute. I regret to inform you that due to a low enrollment, we will need to cancel the Global Change Teacher Institute scheduled for July 13-17 this summer at Michigan Tech University. We plan to offer the Global Change Teacher Institute again next summer, so hope you will come then. We have offered the Global Change teacher institute annually since 2005, except for one year. Last year, we had the best teacher evaluations ever! We do have enough participants to offer the other two teacher institutes listed below, and you are welcome to register for these, even tho the registration deadline was last Friday, June 19. Monday began an adventure for twenty Detroit high school students, exploring careers in natural resources, environmental science and engineering, forestry, environmental, civil and mechanical engineering and more. Thanks to donations from numerous Michigan Tech departments and offices, students have received free transportation, food and lodging in Wadsworth Residence Hall and an exciting program. The students are in grades 9-12 and come from eight different Detroit high schools. They successfully applied for this program (first of its kind), which was made possible by the efforts of many people—from help with recruitment in Detroit, to the multiple experts volunteering their time to present to these youth. Students arrived eager to visit Michigan Tech’s campus, explore future careers and gain new experiences. They began their week participating in a Great Lakes investigation aboard Michigan Tech’s Agassiz research vessel in Lake Superior. They have a full schedule for the rest of the week with various activities including identifying trees, measuring forest plots, inventorying invasive earthworms, visiting the underground rhyzotron, assessing the health of local streams, manipulating underwater autonomous remotely operated vehicles, visiting labs, conducting insect and wetland inventories and exploring nearby state and county parks in the beautiful Keweenaw and Upper Peninsula. This program was coordinated by Joan Chadde, director of the Michigan Center for Science & Environmental Outreach in collaboration with Detroit colleagues at the Belle Isle Nature Zoo and US Forest Service Urban Connections Program. The program was made possible with funding from the Michigan Tech School of Forest Resources & Environmental Science, Michigan Tech College of Engineering, Michigan Tech Housing & Residence Life, Michigan Tech Admissions, Department of Civil & Engineering, Pre-College Outreach Initiative, Michigan Tech Transportation Institute and the Department of Mechanical Engineering-Engineering Mechanics. HOUGHTON – Twenty high school students from Detroit are at Michigan Technological University this week to learn about careers in natural resources, environmental science and engineering. Read more at the Mining Gazette, by Garrett Neese (subscription required). The 2015 Green Film Series presents, “A Will for the Woods, from 7 – 9 p.m. Thursday, June 18, 2015, in Hesterberg Hall & Atrium in Forestry Building at Michigan Tech. There is no admission charged and free refreshments will be provided by the Keweenaw Green Burial Association which will lead a discussion following the film. In the first event, at 7 p.m. on Thursday, June 18, in G002 Hesterberg Hall, Michigan Tech Forestry Building, the Green Film Series will screen A Will for the Woods, a documentary about Clark Wang, a musician and psychiatrist who was determined that his last performance would be a gift back to the planet. Viewers will witness Wang preparing for his own green burial and, in so doing, creating that option for others in his community. Two days later, from 10 a.m. to noon on Saturday, June 20, at Portage Lake District Library, the KGBA will host a community forum facilitated by Michigan resident Merilynne Rush, a Natural Death Care educator and board member of the Green Burial Council International. Rush will take the audience through an examination of conventional funeral and burial practices, their environmental and social implications, and what green burial is and is not. Prior registration is not required for either event, and both are open to the public free of charge (donations always welcome). From the College of Engineering Blog. REGISTRATION EXTENDED to JUNE 30! See Teacher Professional Development – Current Institutes for details about the courses. 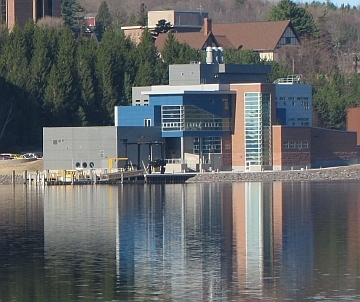 Registration is open for 2015 Summer Science Camps at Michigan Tech’s Great Lakes Research Center. There are two sessions, one for grades one through three and another for grades four through six. Explore the earth and its place in the solar system, investigate the planets, moons and other celestial objects in our galaxy, plus types of stars and other aspects of space–nebulae and black holes. Marvel over the history of space exploration and launch a rocket. Always lots of hands on activities. Cost is $120 and space is limited to 20 students. Pay by credit card, space not reserved until payment is received. Register Online. For more information call 7-3341. Sponsored by the Western Upper Peninsula Center for Science, Mathematics and Environmental Education. REGISTRATION EXTENDED to JUNE 19! Joan Chadde, coordinator of the Michigan Tech Center for Science and Environmental Outreach is taking part in six Lake Superior Stewardship Initiative placed-based education program this week. Activities involve Dollar Bay Elementary, Jeffers High School, Houghton Middle School and the Washington Middle School, and take place at the Great Lakes Research Center, Marsin Center, Calumet Waterworks Park and onboard the research vessel Agassiz. LAKE PERRAULT – Jeffers High School students spent Monday learning out of the classroom. 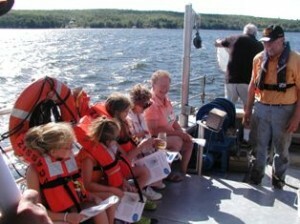 Olivia Johnson, a ninth-grader at Jeffers, said her favorite part was measuring water quality and temperature. “You get to actually work with the sensors and tools to learn how to do it,” she said. Read more at the Mining Gazette (subscription required), by Garrett Neese. Each year WMS students show off their stewardship projects as presenters to parents and community partners at the township beach and School Forest areas. These place-based projects are a part of the Lake Superior Stewardship Initiative (LSSI) in conjunction with community partners Calumet Township, BHK Great Explorations, Keweenaw National Historical Park, The Alliance for the Great Lakes, and Michigan American Water Company. 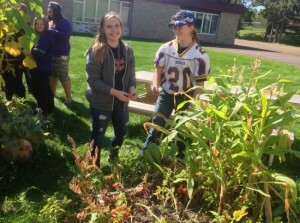 LAKE LINDEN — Students from Lake Linden-Hubbell High School biology and English classes spent an afternoon of hands-on science activities, combined with a game of disc golf and poetry writing, on May 15, 2015, at the Lake Linden Sands Superfund site, where vegetation now covers stamp sand — a waste product left by the copper industry. Read more at Keweenaw Now, by Michele Bourdieu. On Monday, June 1st through Thurs June 4th, local school students were introduced to various STEM education and Career opportunities. Dollar Bay Elementary School had scientific excursions on the RV Agassiz, and saw science projects at 102 GLRC, and 104 GLRC. The program is funded by General Motors Ride the Waves program. Read more and watch the video at the College of Engineering Blog.